Size: Outer circle diameter: 12 1/2", plant holder diameter: 6". This minimalist planter brightens up any room in the home with its gently modern simplicity. It is perfect to show your plants some love with this elegant. Simple, yet meticulously. This metal plant holder is great to give your home an unique look. This minimalist and trendy plant holder fits perfectly into bohomian or modern home decors. Display your potted plants in a surprising new way with this flower pot holder. This minimalist hanging planter brightens up any room in the home with its gently modern simplicity. It is perfect to show your plants some love with this elegant. Simple, yet meticulously. No flower pot or plant included in this item! Material: metal, cotton rope. Strong and durable. Suitable for indoor and outdoor use. Match with round flower pot to brighten up your home. 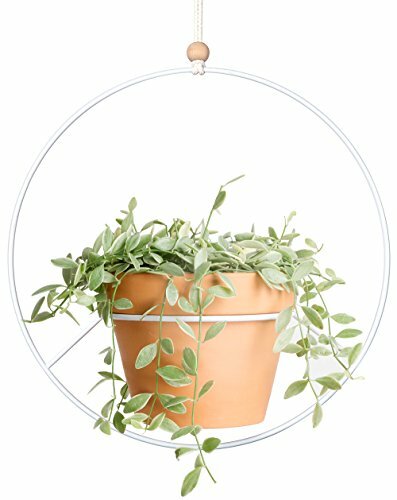 Adding some modern accent and charm to your space with this special circular plant holder. Simply fill in with your favourite green and get hangging with a cotton rope. Suitable for standard terra cotta flower pots about 6" in diameter, maximum diameter of 6" round glass bowl, other pots height should be within 5" - 6". In the pictures, the flower pot shown is 6" in diameter, 5" height. Please be careful for the size of this metal plant hanger. Size is appromixately: Outer circle diameter is 12 1/2", plant holder is 6" in diameter, 5" height. Mkono is a registered trademark and our product is professional manufacturing and sole selling.